General Electric (GE) is one of the world's largest corporations and is a major manufacturer of products from "jet engines to power generation, financial services to plastics, and medical imaging to news and information." The company has more than 95 subsidiaries including GE Healthcare, GE Plastics, GE Security, General Electric Capital Corporation, NBC, MSNBC, Bravo, SCI FI Channel, USA Network, and Universal Studios. GE sold its shares of NBCUniversal and other television assets to Comcast for $18.1 billion in February 2013. General Electric has been a corporate funder of the American Legislative Exchange Council (ALEC), and a member of ALEC's Tax and Fiscal Policy Task Force. See ALEC Corporations for more. In December 2011, the organization Public Campaign published a report called "For Hire: Lobbyists or the 99%?" 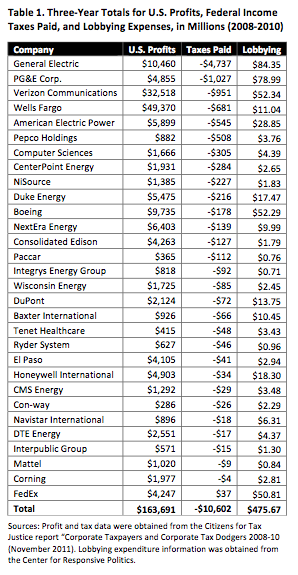 on corporations that have paid more on lobbying than on federal taxes. General Electric topped the list, with $10,460 million in profits from 2008-2010, a net gain of $4,737 million in taxes (after receiving tax rebates) and a total expenditure of $84.35 million on lobbying. GE's disclosure came after a decade of pressure from the Tri-State Coalition for Responsible Investment, a coalition of Roman Catholic groups that filed shareholder resolutions requesting the information. Coalition director Patricia Daly said the money could "have gone a long, long way in cleaning up the problem," had it not been "wasted on PR, lobbying and courtroom delaying tactics." The Environmental Protection Agency ordered GE to clean up the Hudson in 2002. "In October 2005, more than 20 years after the EPA designated the Hudson River among the worst Superfund sites, GE agreed in a settlement to begin dredging the river. The EPA estimated that dredging the toxic sediment would cost $700 million by the time the project was complete. But the agreement obligates GE for costs only in the first year, which could allow the company to avoid $600 million in cleanup costs, according to Leo Rosales, who was an EPA spokesman at the time." The nonprofit economic research organization, Policy Matters Ohio, interviewed workers in 2007 in one of GE's Chinese suppliers and published a report of their findings in 2008. Xiamen Topstar Lighting Co., a joint venture of GE and China's Topstar, employs 6,000 people in Fujian Province making compact (and energy efficient) florescent lightbulbs for GE. Policy Matters Ohio investigators found a range of unfair and unsafe labor practices, including 64-hour workweeks without overtime pay or worker access to their own paystubs. They also found that workers were being exposed to mercury without their knowledge. GE Energy Financial Services, GE's energy investing arm, owns 51.5% of the coal-fired Birchwood Power Facility near King George, Virginia. J-POWER acquired a 49.5% stake in the 242-megawatt power plant in May 2008. On January 18, 2011, GE announced that it would be forming a "clean coal" technology joint venture in China with the Shenhua Group, a state-owned coal mining and energy company. The joint venture company will sell industrial coal gasification technology licenses, conduct research and development and develop facilities around integrated gasification combined cycle (IGCC). GE plans to announce over $2 billion in locomotives and other deals in China, as GE’s sales to China are growing at 20 percent a year. Khosla Ventures recently invested in clean coal startup Ciris Energy — which GE also backs. In September 2011 Keith White, director of GE Energy’s coal gasification business stated, "We make a majority of our money in China today. They use their coal for quality high-end products." White said that businesses should continue their support of coal-gasification and keep in mind the need to expand to additional markets like plastics and other refined products. He noted that a high volume of coal in China is refined into liquid byproducts "such as naphtha, and other products that are the feedstock of plastics and the Chinese garment industry." In May 2013 it was reported that GE is investing billions of dollars in the new boom of oil and gas drilling. The company is opening a new laboratory in Oklahoma, where it is reported that they will be "buying up related companies, and placing a big bet that cutting-edge science will improve profits for clients and reduce the environmental and health effects of the boom." See the related article, General Electric's Ecomagination Campaign. John J. Brennan, Chairman Emeritus and Senior Advisor, The Vanguard Group, Inc.
Andrea Jung, former Chairman of the Board and Chief Executive Officer, Avon Products, Inc.
Roger S. Penske, Chairman of the Board, Penske Corporation; Chairman of the Board and Chief Executive Officer, Penske Automotive Group, Inc.
Douglas A. Warner III, Former Chairman of the Board, J.P. Morgan Chase & Co.
Donohoe MT, GE - Bringing Bad Things to Life: Cradle to Grave Health Care and the Alliance between General Electric Medical Systems and New York-Presbyterian Hospital, Synthesis/Regeneration 2006(Fall);41:31-3 (print version is abridged version, web address above is for complete version with references. An open-access Powerpoint is available at GE-NY-Presbyterian Hospital Agreement.ppt. No password necessary. Steve Bailey, "Forget the elephant", Boston Globe, June 3, 2005. "GE Opts for Disclosure", O'Dwyers PR Daily, January 11, 2006. Anthony DePalma, "G.E. Moves Ahead on Removal of PCBs From 2 Rivers, but Frustration Remains," New York Times, May 1, 2007. Mary Milliken, "GE 'Green' Ecomagination Unit Gaining Ground--CEO," Reuters, May 25, 2007. ↑ "GE supplier abuses workers, group says" March 28, 2008. ↑ "J-POWER Acquires 49.5 Percent of 242-Megawatt Birchwood Power Plant in King George" Reuters, May 8, 2008. ↑ "GE says it is investing billions to improve fracking" Associated Press, May 28, 2013. ↑ Directors, General Electric, accessed November 25, 2008. ↑ , Yahoo Finance, accessed March 2013. This page was last edited on 27 September 2017, at 23:39.